Lieutenant Jay Catherwood Hormel, son of George A. Hormel, founder of Hormel Foods, was born 11, September 1892. Lieutenant Hormel enlisted in the US Army September of 1917 and was assigned to 301st Ice Plant CO.
One of the biggest problems for the US Military during WWI was shipping both troops and food to Europe. The US hadn't established a very large Navy and relied heavily on the United Kingdom's HRM Navy for transport to the Western Front. Lieutenant Hormel discovered by boning meat prior to freezing it, you could save a significant space. Thus ensuring the Doughboy's had food. 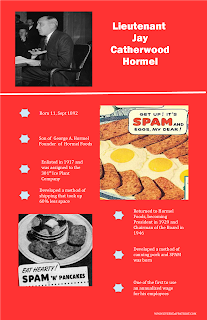 After his service, Lieutenant Hormel went back to work at Hormel Foods, becoming president in 1929 and chairman of the board in 1946. 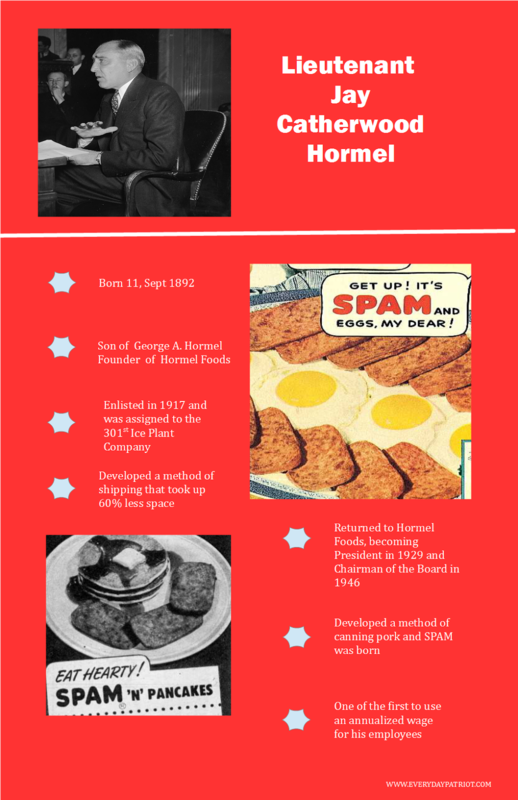 During his time at Hormel, many of the well known Hormel Products were developed, including Dinty Moore Beef Stew, Hormel Chili, Hormel Deviled Ham and of course, the beloved Spam.